Walk-in Date: 04, 05, 6, 16, 24, 25/10/2017. 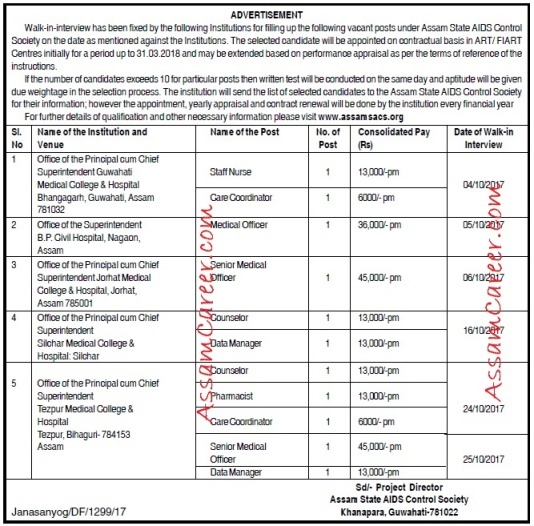 Walk-in-interview has been fixed by the following Institutions for filling up the following vacant posts under Assam State AIDS Control Society on the date as mentioned against the Institutions. The selected candidate will be appointed on contractual basis in ART/ FIART Centres initially for a period up to 31.03.2018 and may be extended based on performance appraisal as per the terms of reference of the instructions.